Las Vegas ziplines send riders soaring through the air at heights up to 500 feet. 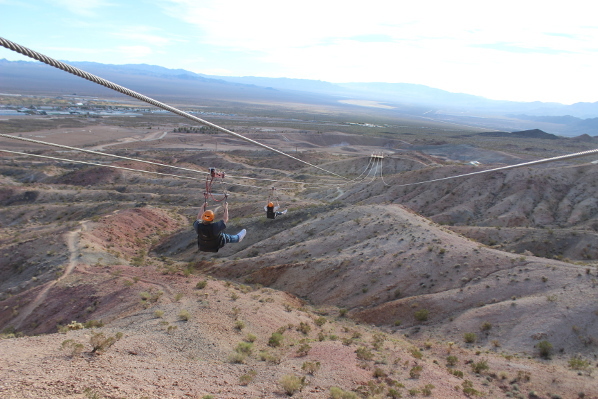 Zip line riders experience the thrill of a lifetime while enjoying breathtaking views of Las Vegas and the beautiful desert landscape. Popular Las Vegas ziplines include SlotZilla Zip Line (located at Fremont Street Experience), Voo Doo Zipline (located Rio All-Suites Hotel & Casino), and Flightlinez Bootleg Canyon Zipline (located in Boulder City, Nevada). 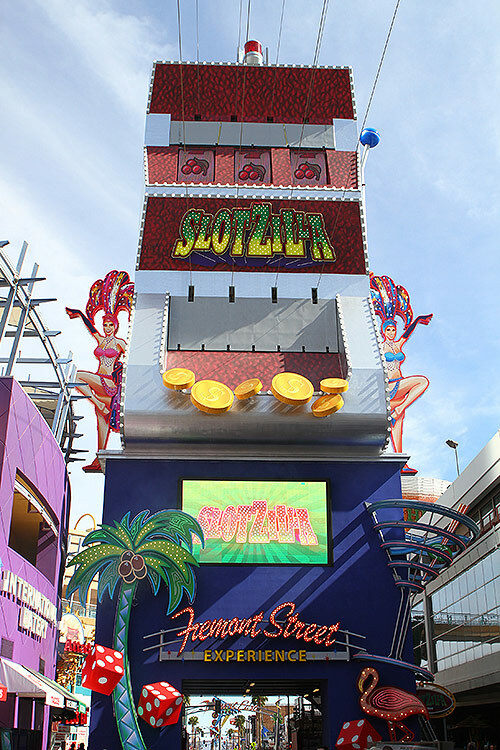 SlotZilla at Fremont Street Experience is a 12-story, slot machine-inspired zip line attraction and is one of the best Las Vegas ziplines. SlotZilla offers two ways to fly, the lower “Zipline” and upper “Zoomline". The Zipline and starts off 77 feet up. Flyers land halfway down the Fremont Street Experience pedestrian promenade, between the Four Queens and Fremont casinos. The Zoomline takes off more than 114 feet up, and whisks flyers 1,750 feet, all the way down the Fremont Street Experience, to a landing platform at the the historic Golden Gate Casino. The upper Zoomline sends flyers prone, or “superhero-style,” for an amazing view of the party that never ends at Fremont Street Experience. 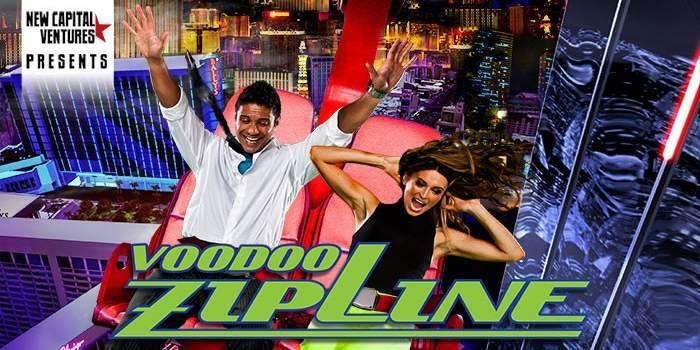 The VooDoo ZipLine is an exhilarating Las Vegas zipline that sends guests soaring higher than 500 feet in the air at electrifying speeds, offering 360-degree open-air views of the Las Vegas Strip. The zip ride takes off from VooDoo Lounge, located atop Rio’s 50-story Masquerade tower, sending guests cascading more than 800 feet to the Ipanema tower, reaching speeds up to 33 miles per hour. VooDoo Zipline can accommodate up to two riders at one time. On the return trip guests will ride an additional 800 feet to the starting point facing backwards. Guests complete four different ziplines. Between the four runs, guests will cover over 8,000 feet (1.5 miles) as you travel at speeds up to 60+ mph down the Red Mountains in Boulder City, NV. The whole experience will last around 3 hours. There is some moderate hiking in the beginning to get to the first zipline. In other areas of the world ziplines are known as “flying foxes”, small scale zip lines located in children’s playgrounds. Zip lines are also referred to as aerial rope slides, Tyrolean traverses, canopy tours, or zip wires. There were only 10 ziplines in the United States in 2001. There are currently over 200, attributed to the growing popularity of extreme outdoor activities. In some parts of China, zip lines transport children to school - Ziplines are used to cross the Nujiang River in the Maji Township. In 1897, the well-known novel by author H.G. Wells mentioned the zip line transportation system as an “incline strong”. Scientists studying rainforests used ziplines as a way to enter the forest without disturbing the animals.